← Happy Mother’s Day !! This time around, I was lucky enough to be selected to participate in the Mary Kay Vox Box! Yeah! My VoxBox has arrived! 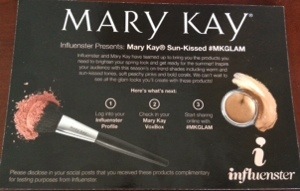 Front of the product information card that shows one of the two brushes that came in the box! The Back of the Product Information Card that lists the remaining products as well as their prices! All of the beautiful products together! This went on smoothly and seemed to add good volume! A nice golden shimmery color that adds a nice glow, I even used it as a highlighter on the top of my cheek bones and nose! I loved this color! It was great in both a light and heavier application and I would imagine it would work well with many skin tones! This was perfect for a touch up in the middle of the day. It took away the oiliness without adding a bunch of weight. I have to say that gel eyeliner is one of my new favorites! It looks like liquid but is much more forgiving when it comes to application! I loved getting this (and the next brush) with all the cosmetics! This worked very well applying the cream eye color! This gave a nice even powder distribution and I can always use new brushes! Overall, I was very impressed with the Mary Kay products! And with a box valued at $133.00 that included 9 products, it seems on par with what I would find at specialty retailers and department stores. 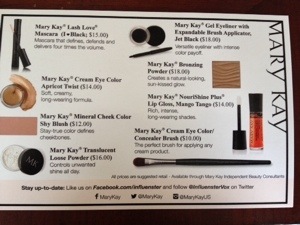 There are a few more products I want to look into and I can totally see myself using Mary Kay in the future!